Some of the city’s most dangerous streets will be overhauled, with studies to start this year. Since the city launched its Vision Zero street safety initiative to eliminate traffic fatalities in a decade, pedestrian fatalities are at a record low. The original Vision Zero came out of Sweden, with a focus on designing around human error. Mayor Bill de Blasio said on Wednesday, as he did last February, that the city would focus on engineering, education, and enforcement to eliminate these deaths. There were 250 total traffic fatalities in 2014, compared to 293 in 2013. Much of the success has come from redesigning streets, because that’s what the data called for. 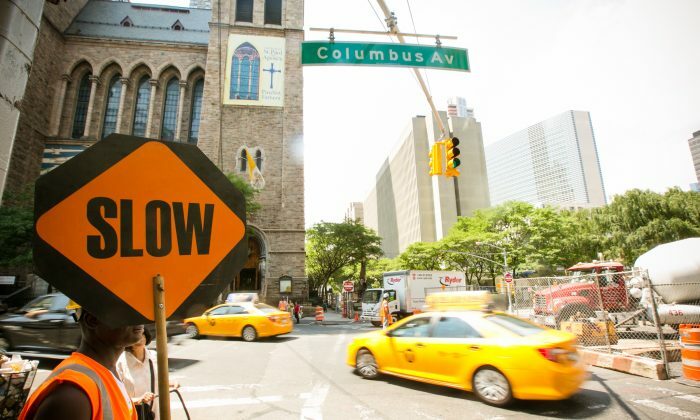 Over half New York City traffic fatalities come from just 15 percent of the streets—the major arteries. On a road that wide, it generally feels natural to speed. A badly designed street can also cause crashes because traffic moves in a conflicting way. Since the city launched its Vision Zero pedestrian fatalities are at a record low. In 2014, the citywide speed limit was lowered from 30 mph to 25 mph. Additional slow zones have been installed, signals have been modified at several intersections to better mitigate vehicle and pedestrian traffic, and physical changes have been made to the widths of some streets. Queens Boulevard has been nicknamed the “Boulevard of Death.” In 2013, six pedestrians died and over 150 people were injured. “It is probably the most notorious in the city,” in terms of pedestrian deaths,” de Blasio said at the press conference. Community visioning sessions to redesign the major roadway will begin in about a month. “We are going to be taking a very expansive look at what we can do there. Everything is on the table,” Transportation Commissioner Polly Trottenberg said. Council members are giving out free bike helmets, sponsoring bus countdown clocks, and pushing for street redesigns in addition to sponsoring legislation. Alison Collard de Beaufort, a freshman at Brooklyn Technical High School, wants to create a network of student advocates for safe streets in schools across the city.